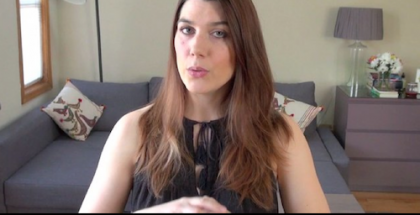 This is a GUEST POST from Zarah of vegtravelguide.com. New Zealand is a country of endless natural beauty just waiting to be explored. Adventure is around every corner, and your experiences are limited only by your own imagination and desire for discovery. 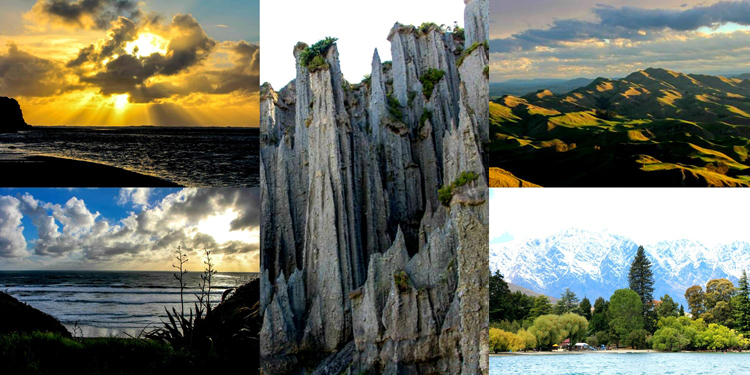 If you are a lover of nature and wildlife, then New Zealand is a premier holiday destination for you. However, the prevalence of meat and dairy in the mainstream dining culture means it can be tricky at times to find vegan menu options, particularly when outside of the major cities. I’ve travelled around New Zealand three times while successfully maintaining a vegan lifestyle. I give you our top five vegan travel tips to make your NZ holiday a thoroughly rewarding experience and the trip of a lifetime! There is so much fresh locally-grown food available in New Zealand. Take advantage of it if you can! You will find an abundance of road-side produce stalls, so make sure you keep an eye out for signs if you’re on a driving holiday. A lot of these stalls are small scale and operate on an honesty box system. Some of the best bargains I recently discovered were 10 avocados for $3 and 3 pumpkins for $1! Not only is this the best way to see NZ, but it also makes self-catering an absolute breeze! 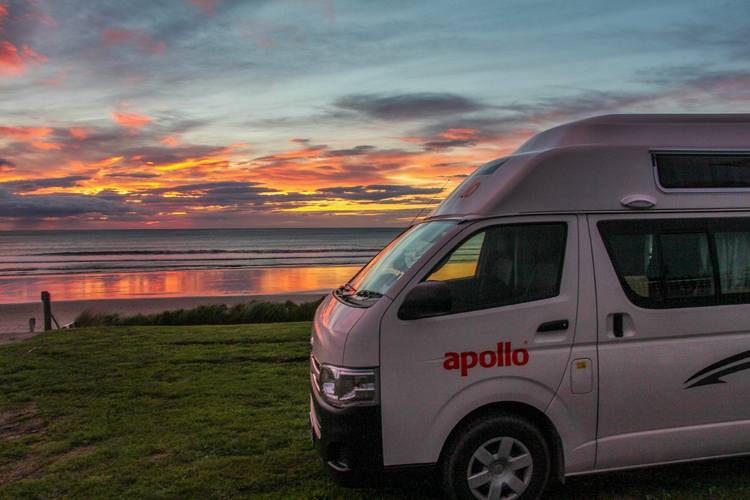 Campervanning allows you to fully appreciate the beautiful countryside and coastal scenery that New Zealand is famous for. You will probably find yourself making regular unplanned stops as you will come across breathtaking sights all the way along your journey. Find a place to park, make your own lunch in your campervan mini-kitchen, and enjoy the view! There are hundreds of well-maintained holiday parks around the country, some of them in spectacular locations. A powered site normally costs between $10 – $15 per person per night. The Department of Conservation (DOC) also maintains camping sites on conservation land. This is the perfect option for outdoors-loving adventurers, or those after budget travel options. Categories of DOCs campsites range from basic to serviced, so do some planning ahead of time, as some have very limited facilities. Prices range from free to $15 per night, depending on the category of campsite. Another option is ‘freedom camping’, however this has become more regulated in recent years and your campervan will need to be fully self-contained. Make sure you are only staying in areas where camping is permitted. As a vegan traveller, I avoid tourist ‘attractions’ where wild animals are held in captivity. New Zealand is an absolute playground for all those vegans who feel the same, yet would still like to see some wildlife on their travels. New Zealand is renowned for its birdlife. Its long history of isolation and absence of land mammals has made NZ a ‘land of birds’. Just watch out for the famous Kea! 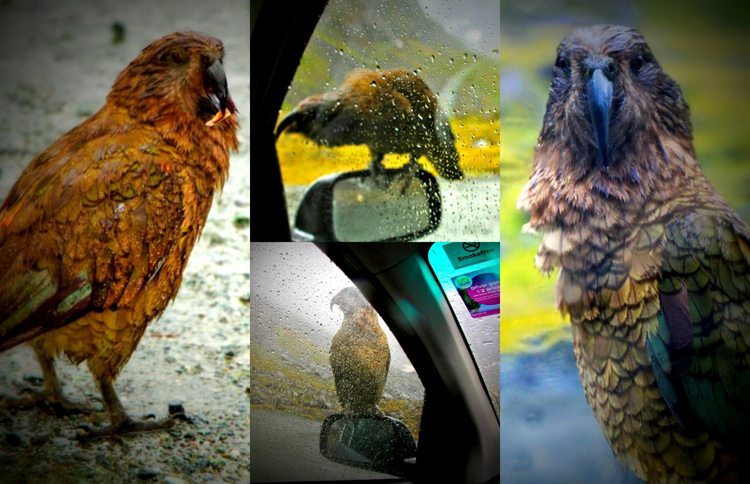 Kea are a mountain parrot with brazen curiosity, notorious for removing rubber exteriors from cars, including windscreen wipers! On our last trip to New Zealand, we encountered two very curious (and not at all shy) Kea on our way back from Milford Sound. Thankfully our rental car survived their attempts to remove the rubber from around the window. Another of the delightful birds that you may encounter on your travels is the penguin! I personally find these little characters absolutely fascinating, and New Zealand is home to three different species! 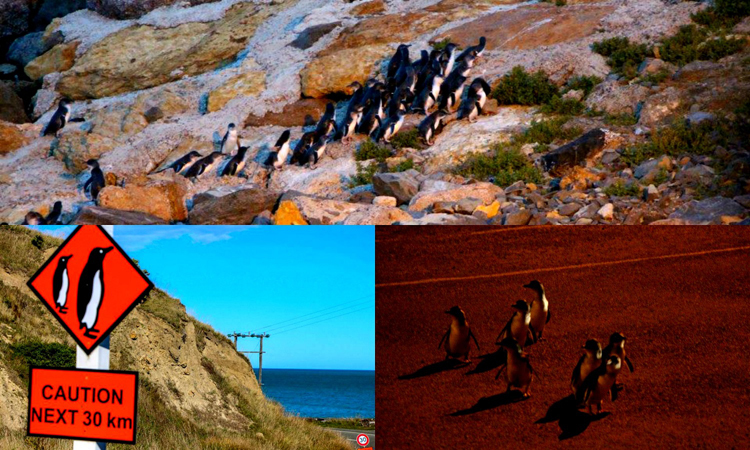 The Little Blue Penguin will be the easiest to spot in the wild, but if you plan your trip accordingly, you may also be able to glimpse the rare Yellow-Eyed Penguin or the Fiordland Crested Penguin. In New Zealand it’s not only about birds though. What about the seals?! There are plenty of opportunities to observe these delightful creatures in the wild. 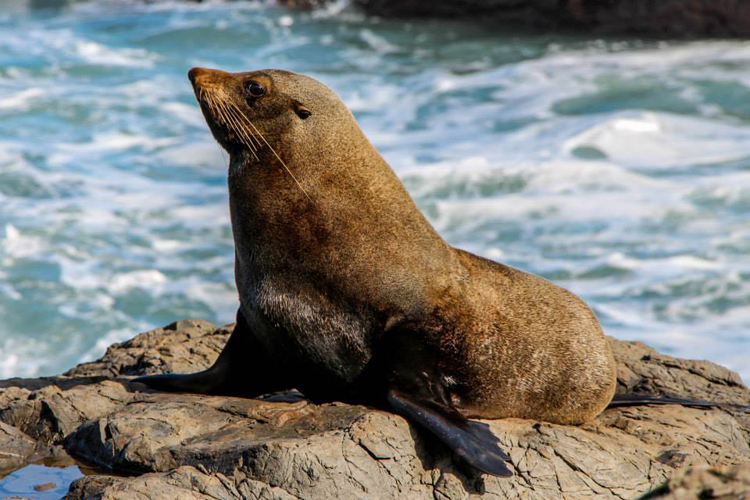 You can spot many colonies of seals around the rocky coastlines. From a distance you may not see them straight away as they are remarkably good at blending in with the rocks. They also have an unparalleled skill of making hard jagged surfaces look extremely comfortable! While they may look big and cuddly, these are wild animals, so remain at a safe distance and do not encroach on their chill out time. This may seem like an obvious tip to any vegan traveller, but it really does pay to do some research beforehand. 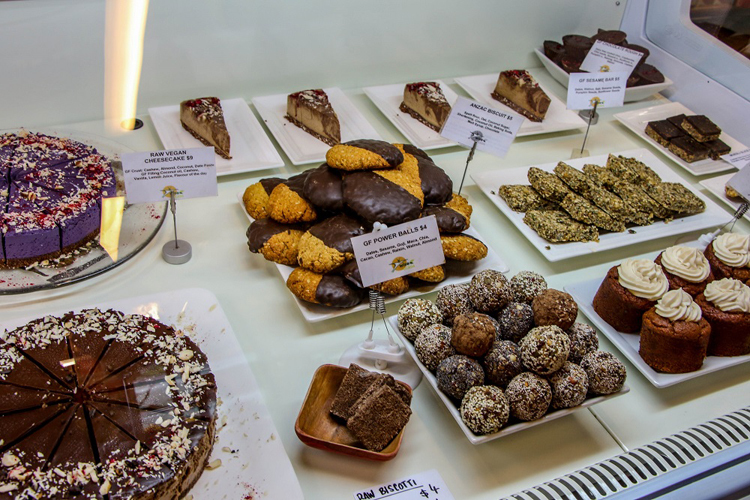 If you are travelling outside of the major areas and not coming across many vegan menu options, it will be a refreshing treat to visit a vegan restaurant. And you don’t want to find that you’ve missed out if a certain restaurant isn’t open at the time you’re passing through. A lot of our travel on my recent trip was through small, non-tourist towns. 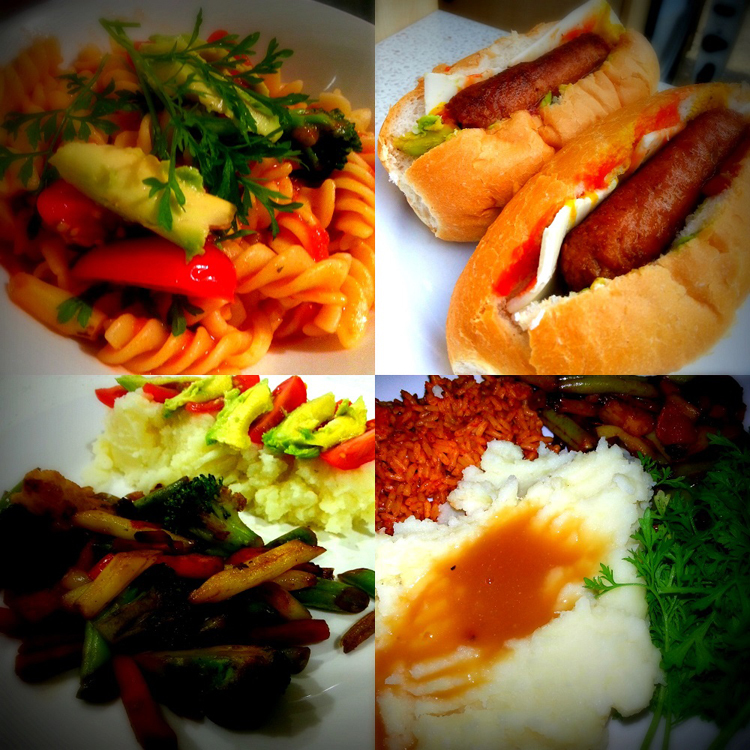 So when we were in Auckland, we totally took advantage of the vegan scene on offer! Honourable mentions must go to Little Bird Organics and Wise Cicada Wholefoods. 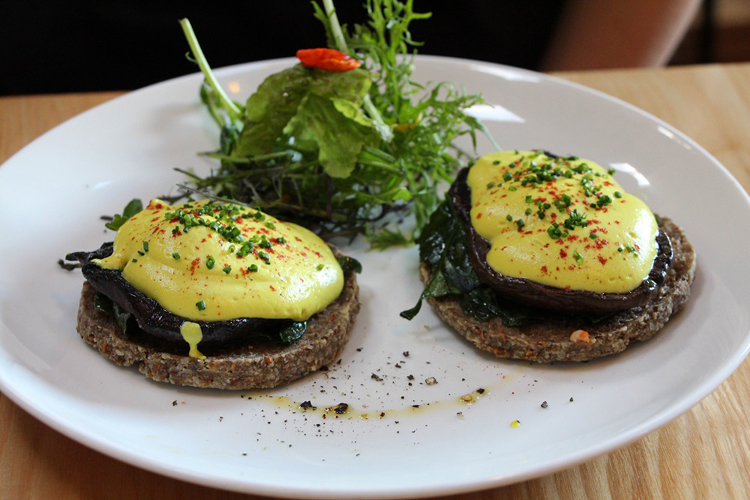 Little Bird Organics in Ponsonby was our first stop as soon as we arrived in New Zealand. 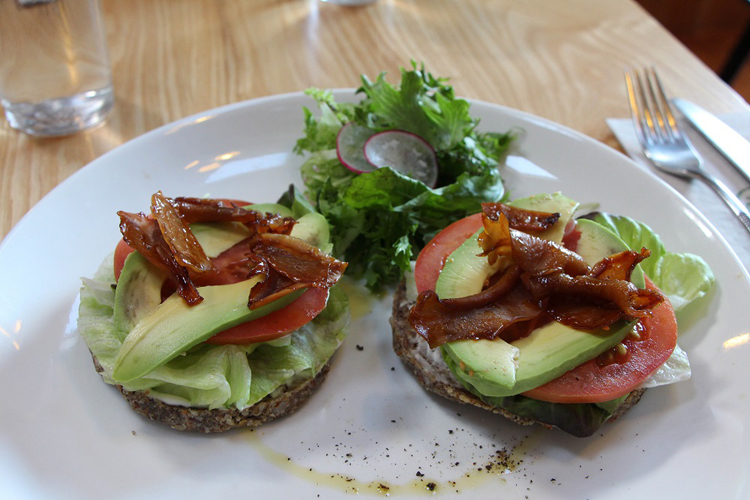 The Ponsonby ‘unbakery’ is the second Little Bird Organics café (opened in January 2014). It is all vegan with lots of raw vegan options. It’s not just the food that is divine, there’s also a really energising atmosphere here. Our other favourite was the Wise Cicada in Newmarket, a community run café. 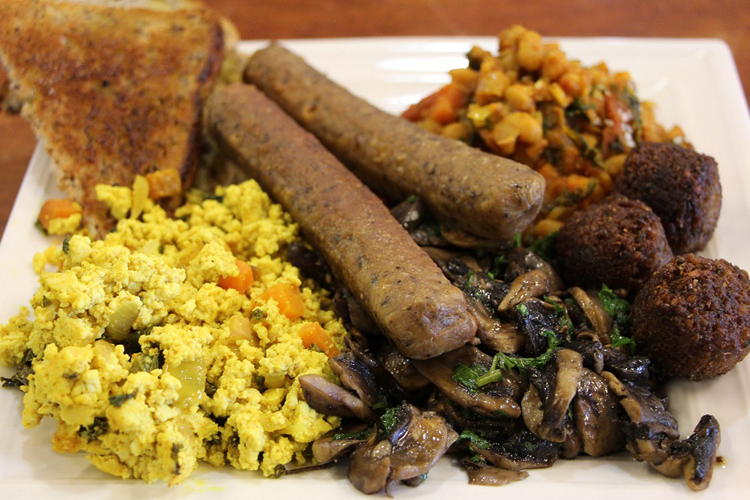 They offer an all-you-can eat vegan breakfast. Need I say more?! 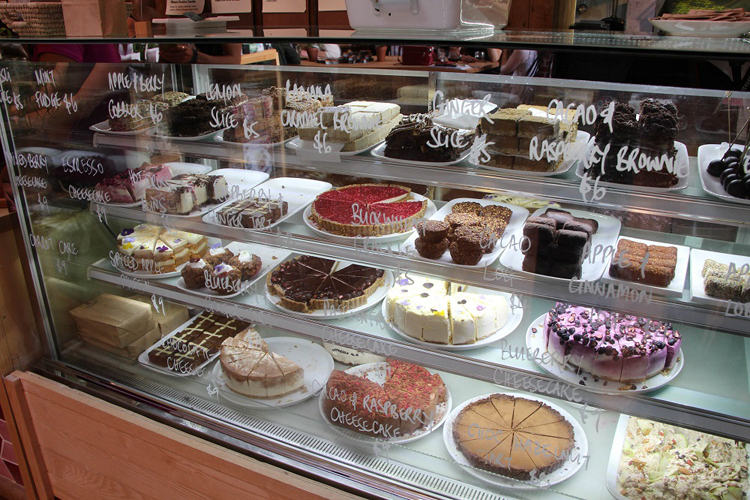 They also have an impressive salad bar and dessert cabinet. New Zealand can get cold, it can get warm, it can get wet, and it can get windy! Even in you are visiting during summer, it can still get quite cold in certain parts. If you are caught out and unprepared for the weather conditions, as a vegan traveller look out for clothing containing wool, down, leather etc. Also be sure to pack your vegan hiking boots – there are endless breath-taking walks to go on. Chocolate lovers will be pleased to know that one of New Zealand’s biggest chocolate brands has a range of vegan-friendly varieties. Whittaker’s Chocolates can be found in all supermarkets and stores around the country. They also don’t use any palm oil in their products. Vegan-friendly varieties include: Fairtrade Dark Ghana, Dark Almond, Ghana Peppermint, and the Bittersweet Peanut Slab. New Zealand, waiting for you to enjoy and explore. 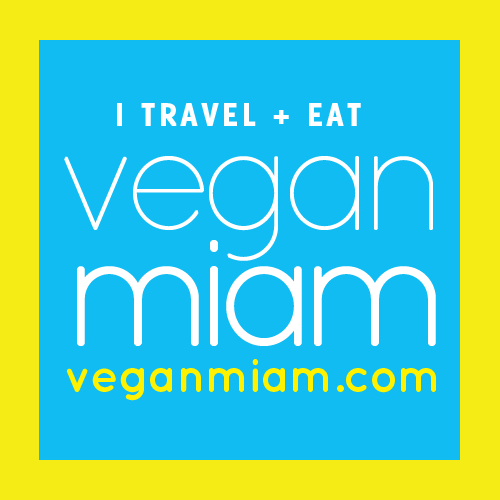 Safe vegan travels! Zarah has been to over 20 countries as a veg traveller. Any trip will almost always involve opportunities to observe wildlife in their natural habitat. Zarah stopped eating animals like it was nineteen ninety-nine. She’s since been livin’ the vegan life for 7+ years. Her passion for travel and animals is matched only by her penchant for beards. 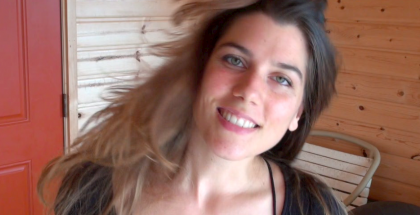 Follow Zarah’s travels at vegtravelguide.com. Attn Graphic Designers: the Book Design Contest is in full swing!